Maintenance scheduling is based on either calendar intervals, equipment counters, fuel consumption or a combination of each. As such, regular updating of the counters will give a more accurate projection of maintenance due. When the counters are not updated, the program uses preset averages to calculate the maintenance projections. To update the counters, tap the equipment row and enter the current counter in the highlight popup. Use the down arrow key on the keyboard to move to the next equipment counter for entry or tap the respective row. Even if a counter has not changed since the last reading, update enter the same counter in so as to reset the 'Last Reading' date. When maintenance based on counters or fuel consumption is completed (i.e. the Work Order is closed), the respective counters are updated from that data entry if the counters are more recent. 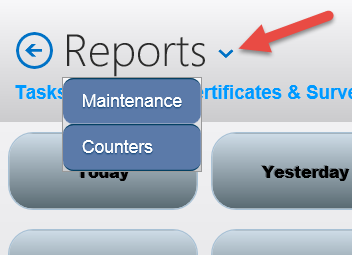 If there is no maintenance based on a specific equipment counter, the Easy PMS will not record that entry. e.g. If Auxiliary Generator maintenance was only based on counters, it would not record a fuel flow meter reading under Fuel (m³) heading. Counter history can also be viewed from this screen.